I’ve just returned from a fantastic weekend in country Victoria to watch the National Road Cycling Championships. It was my first visit but it most certainly won’t be my last. What a fabulous event. It was very professionally run by Cycling Victoria/Australia – the weather was perfect, the crowds not too large and the cycling was awesome. We flew to Melbourne rather than choosing the 10 hour drive south and met up with my cycling enthusiast brother-in-law who drove us up to the goldfields district. He also organised for our free accommodation at his sister’s place near the racing so not only was it a fun weekend, it was a pretty cheap one as well. 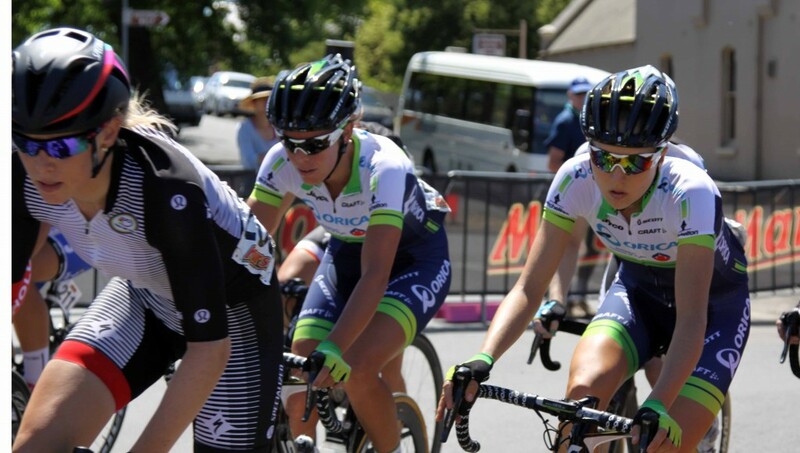 We arrived in Buninyong in time to watch the men’s under 23 road race on Saturday morning followed by the women’s race in the afternoon. For the under 23 race we took up a comfortable position in the sunshine near the finish line and saw fellow New South Welshman Caleb Ewan cross the finish line first. What a talent that young man is. We’ve seen him race on the track many times and he’s equally impressive on the road. He has a bright future and I look forward to following his career. The highlight for me was the women’s race. I’ve seen quite a lot of high level cycle racing in the past five or so years since I caught the cycling bug, but sadly I’ve seen very little women’s racing. So it was with eager anticipation that I watched them roll across the start line. The added bonus was that I was cheering on the newest recruit to my own cycling club’s women’s team Nicola Bodor who was racing the national championship for the first time. In her own words, Nicola said she decided five weeks ago to ‘give it bash’ and while she found the experience a little daunting, she tells me she’ll be back again next year. One of the great parts of the Buninyong course is that it is a 10 kilometre lap which means you get to see the riders going past many times over. At most road races I’ve attended you see them once or at best, two or three times during a race or stage, so this is a real spectator’s event. Once the women had rolled across the line we headed up the hill out of the township of Buninyong on foot and watched the women’s peleton pass us by. The race is long enough that you can wander from spot to spot to get a varied view. We even had time to pop into the local bakery for an obligatory pie. A great Australian tradition washed down with my favourite – sarsparilla. The women’s race was a real pearler. Victorian rider Lisa Jacobs pushed the group by making a solo break for a good many laps. She was joined by fellow Victorian Bridie O’Donnell before both were swallowed by what remained of the peleton to make for an exciting finish. Defending champion Gracie Elvin took the top step of the podium but there were others that were impressive including Tiffany Cromwell who had only one team mate in the race but still managed a fourth place. I actually found the frequent mention of teamwork, particularly from the Orica-AIS/Greenedge camp, a little confusing. I was under the impression that the national title was considered an individual race but riders clearly ride for teams, they even wear their team kit when they could race in state colours. I’d be interested to hear from others who know more than me on this subject. Either way the event was impressive but it seems that those with the larger teams have a distinct advantage. It’s no accident that both the women’s and men’s races were won by riders from the largest team there. On Sunday morning my fellow Sydney-sider Donna Meehan and I attended a forum about women’s cycling run by Cycling Victoria/Australia. The forum was led by Monique Hanley from Cycling Victoria and Tracey Gaudry from the UCI. It was excellent to hear about plans for advancing women’s cycling at all levels including the plans to get more women’s cycling on TV. I’ll tell you more about this in another post, plus an upcoming interview with Tracey Gaudry. We watched the men’s elite race on Sunday from a number of vantage points. It was great to see the duelling between Australia’s best male riders including Cadel Evans, Richie Porte and Simon Gerrans. Not only did we see them up close by standing on the side of the road, they were going at a moderate pace because they were heading up hill so it gave us a real chance to cheer them on. You get that close you could reach out and touch them (or push them off their bikes – definitely not a good idea). Now don’t go telling too many people about this great event because the crowds will grow too big. However, I’d thoroughly recommend it to any cycling fans.